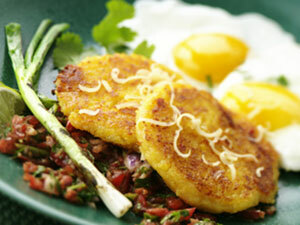 Your guests will love this South American twist on breakfast. Arepas—flatbreads made of ground maize—are topped with shredded Wisconsin aged gouda cheese, fried eggs and salsa fresca. Make salsa in medium bowl, gently toss together tomatoes, onion, garlic, lime juice, jalapeño, cilantro, salt and pepper; set aside. Heat 2 tablespoons butter in skillet over medium heat. Add tortilla and fry for 10 to 15 seconds, flip and sprinkle with 3 tablespoons queso quesadilla. Cook 10 to 15 seconds more, place tortilla on pan and place in oven; repeat with remaining tortillas. Warm tortillas in oven until cheese is fully melted, about 2 minutes.